You can share your re-creation of this recipe or any other recipe from Rasoi Recipe on our Facebook page or directly mail it to me on rasoirecipe@gmail.com . I would love to hear from you guys. If you have any suggestions or if you want to share your views or appreciation, you can leave your message in the comment section below. Whole red chillies 4 no. Heat oil in a deep pan. 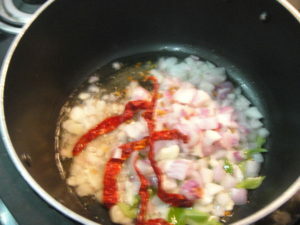 Add chopped garlic, onion, dry red chillies, fenugreek seeds, cumin seeds and curry leaves. Saute for few seconds. 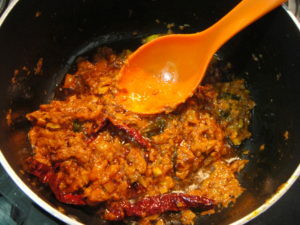 Add salt, turmeric, red chili powder, coriander powder, tomato puree and chopped tomatoes . Fry everything well till oil separates. Add boiled eggs and green chilies, cook it for 5 more mins. Serve it with Lachha paratha/roti/rice. You can also add coconut milk in this recipe. Add coconut milk along with boiled eggs and green chilies. wow perfect dish for a perfect dinner. 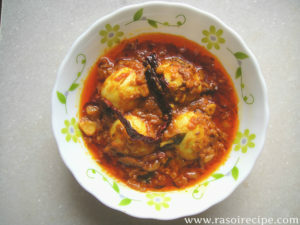 you know Alisha, this dish also my hubby’s favourite. Indirectly you are helping me to serve him dinner as a best. Wow i love eggs. Looks delicious. I will try this. Let me also know about your experience with the dish.